With the rise of Instagram and other social media platforms, everyone has the ability to be a semi-professional photographer these days; it just comes down to the quality of your camera. Yes, you can get some pretty awesome shots on your iPhone, but the problem with using your phone as a camera is that Apple have most definitely not designed their phones to be adventure-friendly. The slightest moisture in the air could kill it off in an instant, and if you drop it, well, it doesn’t bear thinking about. If you’re off on your travels or simply want a more robust camera for your next family holiday, there are plenty of options out there to cater to your needs. If you’re a complete novice to photography or you’re not all that tech-savvy, then don’t panic. Compact cameras are often the most intuitive to use, and since they’re not packed full of different features and controls, it means they’re pretty lightweight and easy to hold, too; perfect if you find yourself a bit of a klutz and don’t want to risk damaging an expensive piece of kit on your first outing. For those wanting to capture action shots, such as when skiing, hiking or other adventures, a DSLR might be more suited to capturing clear shots. A DSLR will have more control features, including lens options and fast-focus for non-blurry images. Mirrorless cameras or hybrid cameras offer very similar features, except they do not have a mirror reflex optical viewfinder, which basically means you can have interchangeable lenses, with the added benefit of it being a little more lightweight than a DSLR, which could be desirable to backpackers or those with limited luggage space. The one thing these cameras can’t do, though, is underwater action shots. 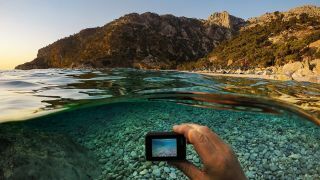 So if you want to capture some water sports shots or you’re just messing about in the pool, GoPro is the go to camera for you. These little cameras are built to withstand adventure and are actually pretty great for taking selfies, too. Once you’ve decided the type of camera you want, you may want to consider the added features and benefits that come with it. For example, do you want to take videos on it as well as photos? Make sure you check the video quality before purchasing. And do you want to instantly upload your pictures to your social media or cloud storage? If so, a camera with built-in Wi-Fi can really help you manage your photos when on your travels. Check out our list of the best travel cameras to suit your needs, and make sure you thank us when you become Insta-famous! Need a bit more insight into the world of cameras? Check out T3.com's camera buying guide to help you get to grip with the basics. The Nikon D3400 may not be the newest or flashiest model on the market right now, but as a hobbyist’s camera, it’s viewed as one that is easy-to-use and reliable; just what you want when on holiday. It’s made our top spot for its intuitive design, and big LCD screen which reportedly makes taking sharp, high-quality images a breeze, and it also has a guide mode which is designed to instantly provide assistance in taking the best pictures on the go. It does have integrated Bluetooth with a SnapBridge function for transferring photos to your phone, which some users found a little slow, but reliable nonetheless. For the price, you can expect some cracking holiday snaps that are bound to impress your family and friends. If you’re someone who snaps all day every day on their holiday, you can expect great results from the Panasonic Lumix G7. With great spec, including 4K video and a mirrorless design for interchanging lenses, you can capture your travels with ease without compromising on quality. Mirrorless is known to be lighter than DSLR cameras, which may be favourable if you don’t want to carry any extra weight on your trip, and this model reportedly has great battery life which makes it a reliable choice for day trips and excursions. The only downside is some found the design of the psychical appearance of the camera to be a little basic, but it’s important to remember that it’s not all about looks. What this camera may lack in aesthetic appeal, it sure makes up for in features and quality. If you’ve used Nikon cameras before and you’re looking to upgrade to a newer model, then the Nikon D7500 is highly regarded in terms of quality. It shoots faster, and has a whole host of new features to play around with, which admittedly are likely to be a little complex if you’re a novice. But if you’re familiar with how a DSLR works, then you’re bound to have fun figuring out all the great things this camera can do. It’s designed to excel even in low light environments, so you’ll never have to miss a moment due to the time of day, and the touch screen facility has been received as a welcome addition to those who upgraded their Nikon as a nice alternative to always using the eyepiece. Whether you’re looking for a first-time buy that is of excellent quality, or you’re a seasoned traveller who knows a thing or two about cameras, the Sony Alpha 6000 is a great value for money camera that delivers in both design and features. Regarded as lightweight and easy to handle, this could quite possibly be one of the best travel cameras for backpackers who are frequently stopping and snapping on their travels. Users like the solid construction, so if you like the look of the Lumix G7 but feel weary about the feel of it, then the Alpha 6000 could be the perfect alternative. It doesn’t have a touchscreen, but with such great specs and its fast performance, it’s really not a necessity. This is probably the most compact of compact cameras on our list, with a sleek design that makes this model appealing in regards to both aesthetics and features. The ultra-slim model still packs in some great specs including Built-in Wi-Fi, video and LCD touch screen which means despite the bargain price, you don’t have to worry about being limited in your photography. The touch –screen menu is reportedly a little tricky to get to grips with (quite literally) as it’s quite small and fiddly, but this camera has a full manual mode, too for taking pictures the old-fashioned way. If you’re off on a trip but don’t feel like lugging your DLSR around, you may find this compact just the ticket for quick snaps that don’t compromise too much on quality. The Nikon Coolpix A900 may seem slightly underqualified amongst some of the semi-professional options in our list, but it is highly regarded and often quoted as underrated when it comes to producing high-quality images. It resembles more of your standard digital camera, and therefore doesn’t have a viewfinder, but when it has a 35x optical zoom, you’re likely to find this doesn’t matter too much. It still has the SnapBridge function like most other travel cameras do, so you can share your photos quickly and easily on the go. This camera is also the smallest on the list, so if space is limited, this little compact could be the perfect companion. While all of the cameras on this list are great for different things, there is one thing the GoPro is known best for, and that’s action shots. The GoPro Hero5 is regarded as a fantastic bit of kit that is not only the best way to capture all the in-action footage, but is just general fun for taking selfies and mucking about with your mates. It has one easy button that is pressed to start recording, so it’s safe to say this camera is pretty easy to use, and you can literally take it anywhere as it is completely waterproof up to 10 metres, and that’s just without its plastic housing. Battery life will always be noted as something to improve, but the best way around this is to always have a spare one on you and you won’t miss out on any action.